Last week, the Greater Manchester Integrated Library Cooperative System (GMILCS to its friends) became the first large library system to integrate Chili Fresh into its online catalog. I talked about Chili Fresh last September, when I was helping with some initial testing and design. Unfortunately, my consortium was not in a position to pursue the product at the time, so I'm glad the progressive and flexible GMILCS was able to step in for final testing and be a beta site. Chili Fresh is neat because it doesn't require sweeping changes to a library catalog to bring about improvements. It is a plug-in that allows patrons to add comments and reviews of books right into the library's catalog, for other patrons to read. We need more tools like this. A link to the ratings and reviews is shown on both the search results page and the item details page, and the reviews are displayed in a popup window. Although all the data is stored on Chili Fresh servers, the way it is displayed can be customized to match the look of the catalog. This concept not only provides a valuable readers advisory service, but also gets patrons engaged in the catalog - and, by extension, the library. I don't want to sound like I'm selling this product - I'm not. But I am selling the idea. ILSs are huge, cumbersome and complex, and often wholly lacking in necessary features. Small plug-ins like this (and LibraryThing for Libraries) add tremendous utility to the tools we provide our patrons, at relatively little cost and involvement from libraries. A screenshot of the Chili Fresh admin screen is shown here - click to see a larger view, and for a description of what it allows you to do. More screenshots are on flickr. Please leave a comment if you know of other tools like this - I'd like to make a list of catalog plug-in tools, because until ILSs catch up with patron needs, libraries need a way to provide these features. Posted under Library, Technology on Tuesday, January 29th, 2008 at 12:24 pm, by Brian Herzog. Post and comments available via the RSS 2.0 feed. Both comments and pings are currently closed. Thanks for the update on Chili Fresh Brian! I love the fact that GMILCS is adding innovative tools like LibraryThing and Chili Fresh to make their catalogs more useful for patrons. I have a quick question. I notice in the reviews for Where the Red Fern Grows that there are a lot of reviews from Chelmsford. So does Chili Fresh display comments and ratings from all libraries that are Chili Fresh users or just that one particular library? If it’s from all libraries, that would be pretty cool since it is often difficult to get enough content from users in just one community. And you’re right about getting patrons to contribute – I think that’ll be a big challenge. It’s a nice feature to offer, but I think it’ll take a little while before it really takes off. It might be a good idea for get staff contributing during the initial promotion, so patrons can see how it works. In New Hampshire we like to be first-in-the-nation, but GMILCS is proud to be progressive and flexible. Salt Lake County Libray in Utah went live with ChiliFresh reviews today. Reviewers do need to log in, and the reviews are moderated, but they are shared nationwide. A couple GMILCS libraries are adding reviews their readers wrote (on paper) for book discussion groups. Please wait a few days before going to http://www.chilifresh.com to get more information on how to add this to your catalog. The product is so new that their webpage is not complete. 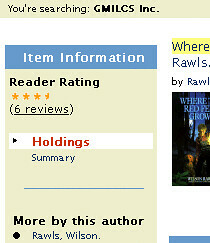 But feel free to add reviews to our catalog at catalog.gmilcs.org!